I watched a bit of George W. Bush on TV last night trying to make the best out of his bad Iran situation. The new intelligence report has poked a big hole in his effort to bomb Iran back into the stone age like he has done to Afghanistan and Iraq. He was not a happy boy. When asked if this in any way indicated that he had not been truthful with the American people Bush flew into a controlled rage. He finished his very crazy defensive remarks by bounding off the podium and through the back door of the press room. He knows now that he has been fully exposed. But even with that he still maintains that Iran must continue to be poked and prodded and tortured to ensure that they never, ever, even consider learning how to make a nuclear weapon. Will that flimsy reasoning be enough to still attack Iran? With Bush-Cheney in power one can never say no. The clear fact that Bush-Cheney have been caught once again manipulating public opinion in order to start another war has to be the straw that broke the camels back. This must be enough to weaken Bush-Cheney so that the Democrats will bring forward impeachment hearings. But will it happen. Not likely, as the Democrats would prefer to just have the B-C rotten corpse just hang in the wind and stink up Washington right up to the next election. But there is nothing more dangerous than a crazy wounded rat, or should I say, two crazy wounded rats. I heard last night that 80% of Republicans in the state of Iowa still support Bush. That number is probably fairly consistent across the country. It indicates to me that the Bush-Cheney strategy is that as long as they still have the majority of their party on-board then that means they still can use the Republicans in Congress to block any effort to cut funding for the Iraq occupation or bring the troops home. Bush's base is sound and thus he can live for another day. As an organizer I find that the Democrats are doing little to challenge Bush's base to move away from him. Unless the Republican base begins to feel the national heat of indictments for criminal activity there is no reason to abandon Bush. But if the Democrats began holding real impeachment hearings and brought forward substantial legal charges then you'd see the rats start jumping ship. The B-C pirate ship would then sink faster than a lobbyist getting a favor from a politician after giving them a campaign donation. I still think it is quite conceivable that Bush (the out of control alcoholic) could attack Iran. His contempt for the American people, the media, the Congress, International law, and our Constitution is palpable. The only way to restrain him is to go after him with the full force of the law. 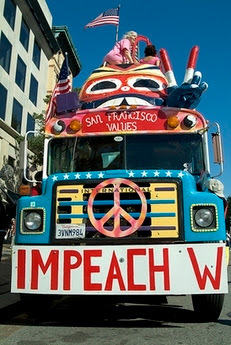 That means the pressure on the Democrats to impeach B-C must be dramatically escalated. The evidence is there to warrant impeachment. 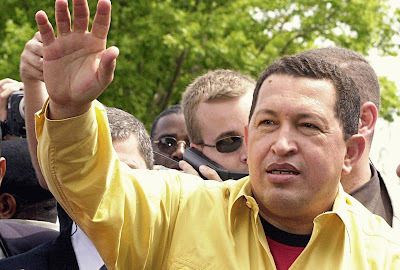 Hugo Chavez wanted a free hand to run Venezuela for a lifetime. On Sunday, in a national referendum people voted 51-49% to reject numerous reforms to the Constitution that would have allowed him to remain in office indefinitely. A telling comment, reported by the Washington Post, was by Wilfredo Vivas, 45, a cabbie, who said among the troubling alterations was one under which Chávez could name governors and mayors. "He says he gives more power to the people, but in that article I see that he's taken power away from the people," Vivas said. "Now we won't elect mayors or governors, but he names them." Part of me can understand that Chavez wants to maintain control to ensure that social progress in Venezuela continues. But becoming a dictator for life is not the solution. Chavez should spend his time and national resources to develop leadership in the local communities and barrios if he wants the progress of social reform to continue. The only way to ensure a generation of progress is to educate and involve people in real decision making at the local level. Consolidating power in the hands of a few is the wrong answer. Chavez has now handed his opponents a great organizing tool to oppose him. Instead of wasting the time and energy this failed referendum took, he should have been doubling his efforts to bring the poor to greater positions of leadership in the country. I'm sure to some extent he has been doing that but it appears that even some of his allies turned against him on this vote. In some cases even his friends could see that Chavez was making a mistake that would alienate him from the public that he purports to serve. The good thing in all of this is that the vote reveals that large segments of even Chavez supporters have now come to expect that the people should control their government. That is the right way for sure. It would be nice if in the U.S. more of our public would demand that "we the people" run our government rather than the corporate lackeys that control our nation today.